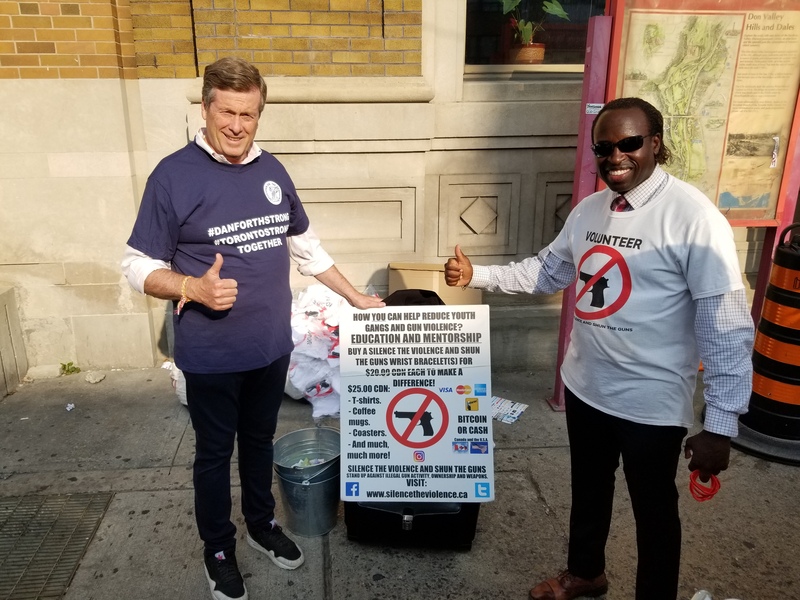 About the images on this webpage: The founder and his team were nearby “Taste of the Danforth” 2018 where Toronto mayor John Tory stopped by to thank him and his organization, Silence the Violence and Shun the Guns, and on many occasions in the past, for their advocacy efforts. Every time he sees the team, he stops by to thank them and at least one of those times they were on live T.V.. They have been in conversations for years, mainly by text message. 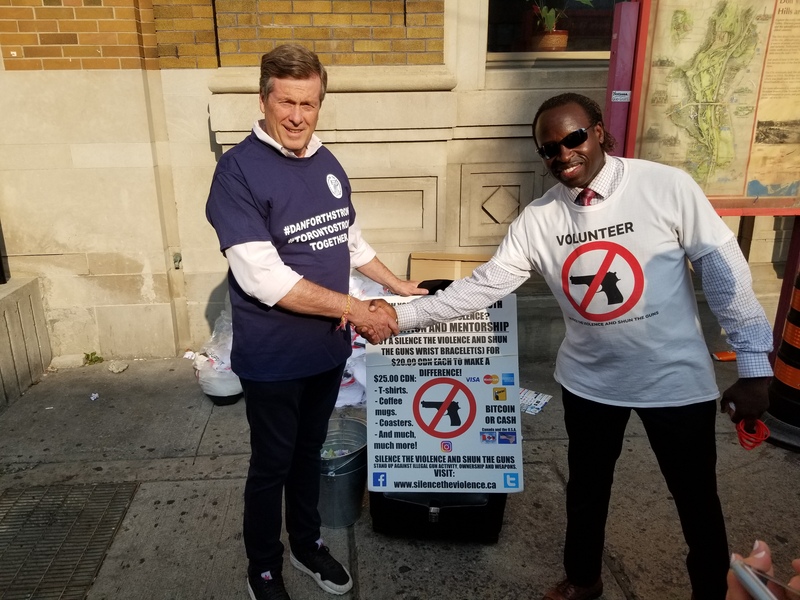 There are 14 local based at-risk youth gangs and anti-gun violence organizations and mayor John Tory has only done photo ops with Silence the Violence and Shun the Guns. He knows that Silence the Violence and Shun the Guns is number one, by far, for several reasons. See our growing portfolio of endorsements by the rich, powerful and famous here. The 2019 March for Education, Mentorship and Equality will be on Friday, September 13th at the same time and location. Details will follow at least 90 days prior to the date. We as a society must understand that “gangs and illegal gun violence effects everyone”. Recently, rising gun violence has taken place in areas which were unimaginable, including the Toronto financial district. With a growing following of supporters for years, mainly concentrated in the Toronto financial district, Silence the Violence and Shun the Guns recently decided that 2018 could not go by without a march. Eight years in and with its financial house in order from day one, a march, at least annually, for this troubling public safety matter based in the Toronto financial district is way overdue. Although this short march over the lunch hour will take place in the Toronto financial district, it is open for everyone to attend. Led by Silence the Violence and Shun the Guns, the march’s goal is to continue to raise awareness and rally more supporters for collective action. Corporate sponsorship opportunities will be the next step and many other doors are about to open. In addition, to have the highest attended march in Canadian history that is against youth gangs and gun violence. There has been no other organization that has managed to engage a financial district in North America anywhere close to the level that Silence the Violence and Shun the Guns has done. A growing list of unprecedented breakthroughs have and are happening with Silence the Violence and Shun the Guns and there are no signs of it slowing down. Join this historic initiative, where others have tried and have fallen short or failed, led by an organization that is doing the work no one wants to do or can. 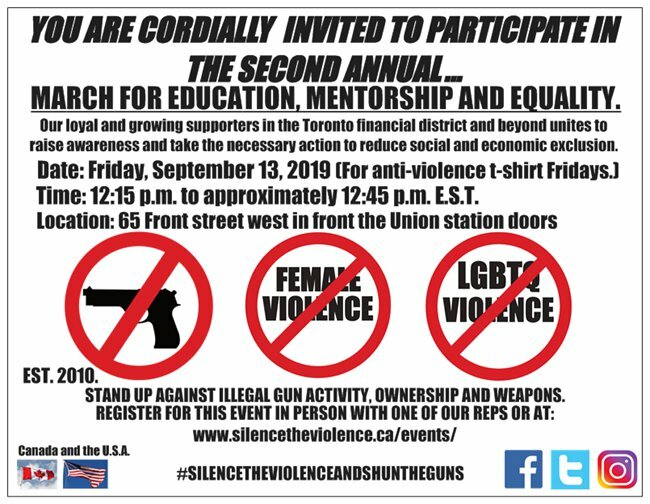 The march will take place on Friday, September 13, 2019 starting at 12:15 p.m. to approximately 12:45 p.m. E.S.T..
- Register, prior to Friday, September 6, 2019, by purchasing at least two Silence the Violence and Shun the Guns t-shirts for the bronze level for $50.00 here. After you complete the online order form, your registration will be complete and you will be kept up to date on future developments and receive an invitation for future events. In other words, buy at least a t-shirt to wear at the march and a wrist bracelet so you can wear it daily, attend the event and then join the march for as long as you can. For “supporting role players”, who chooses not to buy and wear a t-shirt at the march, they will be positioned to march behind those who do. The reason for this is because Silence the Violence and Shun the Guns wants to send a unified message to the public and media that we are on the same page. All those who agrees with and supports Silence the Violence and Shun the Guns’ initiative, are welcome to attend. Anyone who plans to attend with any intentions to cause any disruptions, will be identified and will be appropriately dealt with by plain clothes law enforcement personnel. Only invited media are welcome to attend and may be granted an interview. - Corporate sponsorship opportunities are available for this event. 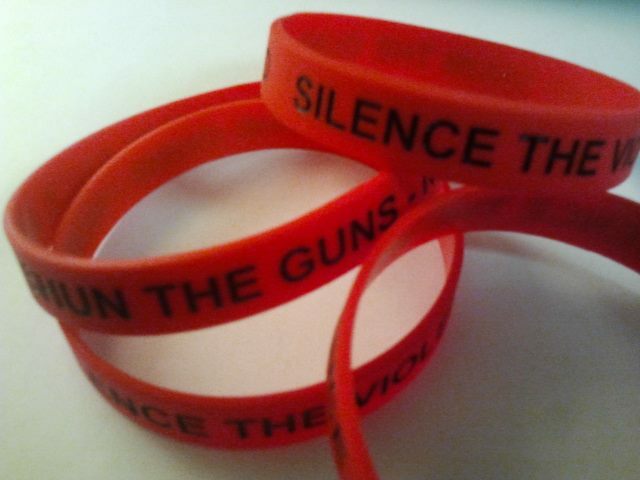 * For all events and outreach engagements, Silence the Violence and Shun the Guns does not accept donations. Instead, your registration fee will be a purchase of the items for sale. You can easily liquidate the items to supporters who you know, which you will be shown how, or you can give the purchased items away. 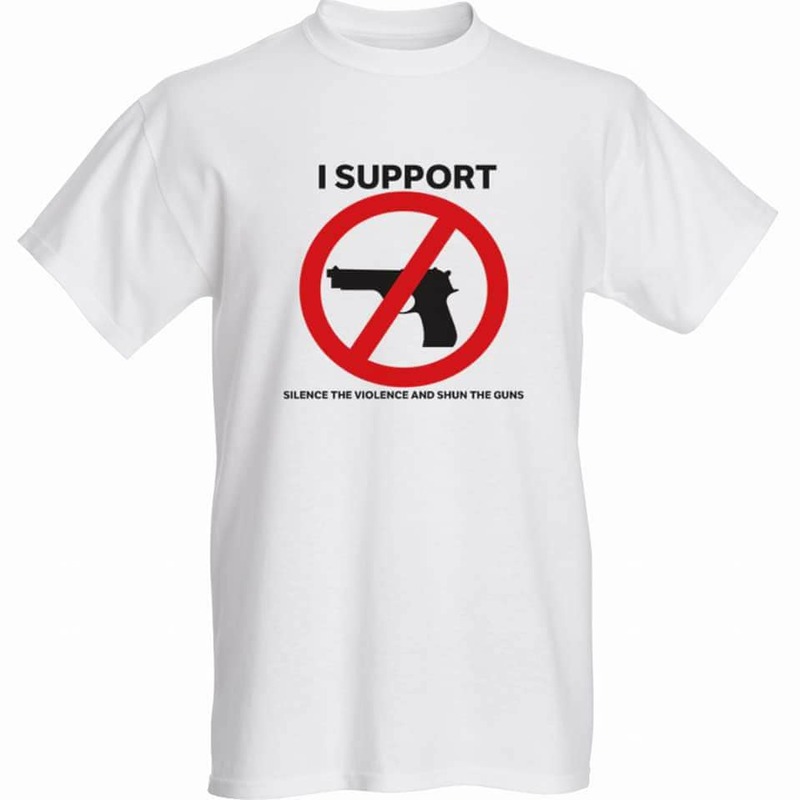 The reason for this approach is to insure that you know which organization you are supporting, what it stands for, its objectives and to help raise more awareness to prepare Silence the Violence and Shun the Guns for the next step in order to generate the money needed to fully self fund this initiative. This “purchase only” approach from inception, insures the highest level of integrity and continues the increasing of ongoing supporters. Silence the Violence and Shun the Guns is a merchandising company, not a charity or non profit organization so no tax receipts are issued. Methods of payment are cash, Interact, all major credit cards and tap is available for all electronic payment on terminals. Receipts are generated for all electronic purchases. - Pick up your t-shirts or items at a predetermined location in the Toronto financial district prior to the march. If you are located in the Toronto financial district, your order will be delivered to you. - Attend the march, prior to 12:15 p.m. on Friday, September 13, 2019, at the starting point, just west of Bay street on Front street across the street from the Fairmont Royal York hotel, (65 Front street west, Union station main entrance. Across the street from Fairmont Royal York hotel) and then march for as long as your time allows you. For your convenience, there will be a vehicle at the starting point, before the march at 11:00 a.m. and 1 hour after the march, with a limited supply of t-shirts, wrist bracelets and coffee mug and coaster sets for sale. There will be a convenience fee of $10.00 which is the same amount charged for shipping and handling when someone buys an item on the website. The total minimum purchase for a t-shirt and wrist bracelet will be $55.00 payable in cash or $58.00 payable using the electronic terminals. To avoid paying the $10.00 convenience fee, you can buy the items in person at “the starting point” from Monday, September 9, 2019 to Thursday, September 12, 2019 4:00 p.m to 6:00 p.m. E.ST.. Weather permitting and while supplies last. Politicians, the police and E.M.S. in the G.T.A. has been invited. If you can not attend the march, buy and wear a t-shirt in solidarity during the time of the march and a wrist bracelet so you can wear it daily. This march can become a global movement without your presence. The march may be live streamed on Silence the Violence and Shun the Guns’ Facebook page. Note: The police at division 52 will be providing security for the event. Practically all patrol officers knows who the founder is. Over the last seven plus years, they have seen him engaging with the public, bought his items, chatted with him and his team regularly, provided tips, encouraged him and generally kept an eye out for him and his team over the years. Overall, they have been extremely respectful and accommodating. And these are the reasons why Silence the Violence and Shun the Guns sells “I RESPECT GOOD POLICING” t-shirts to show respect and appreciation to the police. By promoting good policing to the public, hopefully will improve the image of the police. The march leader - SILENCE THE VIOLENCE! The marchers - AND SHUN THE GUNS! The march leader - WHAT IS THE SOLUTION? The marchers - EDUCATION AND MENTORSHIP! The march leader - WHICH WILL BRING US CLOSER TO? The march leader - WHAT DO WE NEED? Starting at Union station just west of Bay on Front street, turning right travelling north on University Avenue, turning right travelling east on Queen street stopping briefly at Nathan Phillip's square in front of city hall. There will be a few brief announcements and then the march will continue south down Bay street, turning right on Front street back to the starting point at Union station. If you see the procession, buy a t-shirt and a wrist bracelet, put it on and join the march.